Discover, right here in Canada, a wonderful selection of Christian jewelry, including purity rings, pretty cross necklaces and earrings, and rosary bracelets in both the single, one-decade strand, and the five-decade wrap bracelet styles. These products will be coming soon! Please bookmark our site, and check back again for new additions & content. Cross Necklaces ... to come! We will have a variety of unusual & artistic cross necklaces to choose from. These are a beautiful expression of Christian faith, and make lovely gifts for special occasions. Rosary Necklaces ... to come! In the near future, we'll be offering some simply elegant, beaded necklaces reminiscent of the rosary, and in the popular 'Y' style. Single-Decade Rosary Bracelets ... to come! Our Christian jewelry collection will include pretty, beaded rosary bracelets, so you can pray your rosary anytime, anywhere! Full Rosary Wrap Bracelets ... to come! We'll also offer some 5-decade long rosary bracelets that wrap several times around the wrist - no clasps needed! 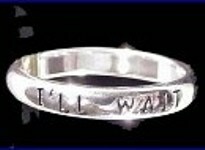 Christian Purity Rings ... to come! 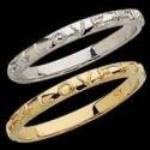 These popular rings make great gifts for young singles. They are both a personal and socially discreet symbol of the commitment to preserve one's virginity until marriage.